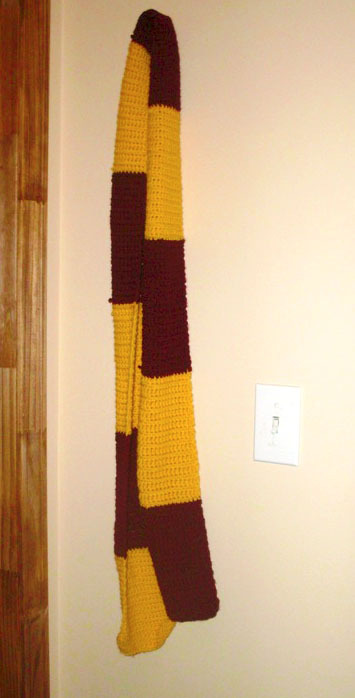 This is the scarf that appears in the first 2 HP movies. 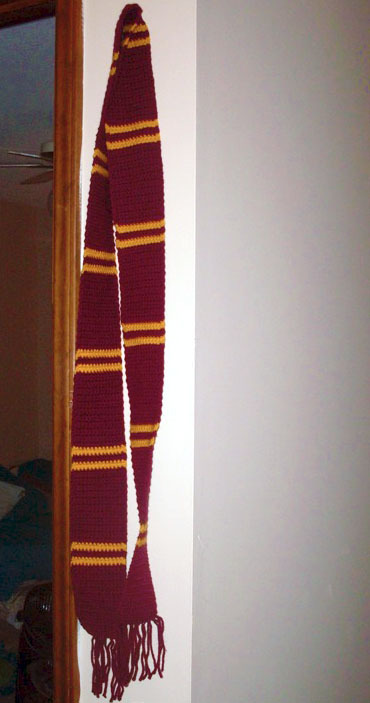 For a Gryffindor house scarf, use burgundy and gold worsted weight yarn and an H hook. Hufflepuff is black and yellow, Ravenclaw is silver and blue, Slytherin is silver and green. Row 1: dc in second ch from hook, dc across. (20 sts) Ch2, turn. Row 2: skip first st, dc across. The ch 2 at the beginning of the row counts as a stitch. (20 sts) Ch2, turn. Row 15: as row 2, but on the last dc, when there are still 2 loops on the hook, pull the second color through instead and ch2 with the new color. Rows 16-29: as row 2 with the second color. Row 30: as row 15 — change colors on the last stitch. Continue in this manner until the scarf is as long as you want it to be. On finishing your last row, tie off and weave in ends. This is the scarf that appears in movies 3+. I used sc for mine, but it took forever so I’m gonna write you a pattern using dc instead that will look just as good! Row 1: dc in second ch from hook, dc across. (15 sts) Ch2, turn. Row 2: skip first st, dc across. The ch 2 at the beginning of the row counts as a stitch. (15 sts) Ch2, turn. Row 10: as row 2, but on the last dc, when there are still 2 loops on the hook, pull the second color through instead and ch2 with the new color. Row 11: as row 2 (with the second color), but on the last dc, when there are still 2 loops on the hook, pull the original color through instead and ch2 with the new color. Row 12: as row 2 (with the original color), but on the last dc, when there are still 2 loops on the hook, pull the second color through instead and ch2 with the new color. Row 13: as row 2 (with the second color), but on the last dc, when there are still 2 loops on the hook, pull the original color through instead and ch2 with the new color. Rows 14-22: as row 2. Row 23: as row 10. Continue in this manner until the scarf is as long as you want it to be, ending with a 10 row block of color. On finishing your last row, tie off and weave in ends. Add fringe if desired by tying yarn in between your stitches and cutting them to the desired length.